Random ideas hit me. They fall from the sky in a cascade of sparkling irregularities. Often times, they do not make sense. Yet, if the giggle factor is high enough I may try to implement them. Welcome to my Awake Chocolate Project for Fanfest. 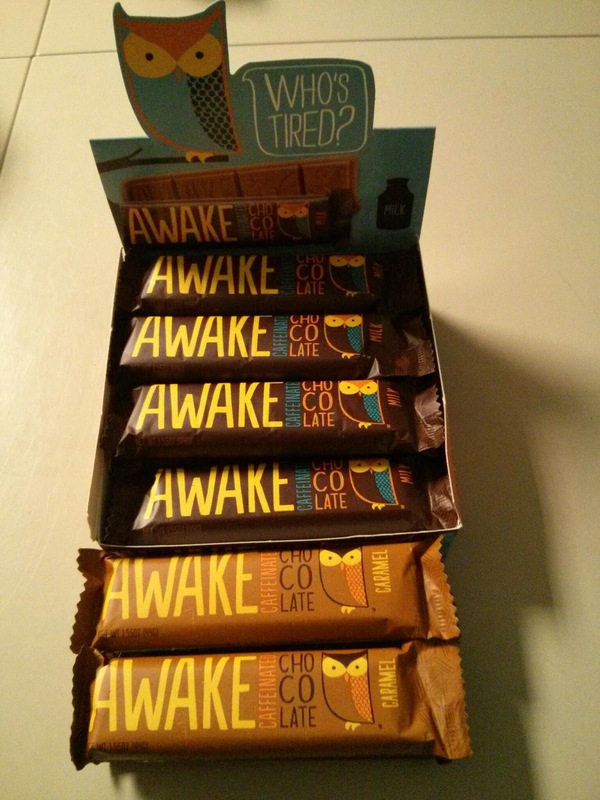 Last week, while swinging through one of the local gas stations I noticed Awake Chocolate bars. Chocolate bars that said they had a cup of coffee worth of caffeine inside of them. How interesting. I thought about it. I left. I returned. I got one. It wasn’t bad. The other day I was again at that gas station and I thought, “Wouldn’t it be funny if I gave out these chocolate bars at fanfest?” I went home and discovered that it is still mostly a Canadian thing. Per their website there is no distributor near me. Yet, here they are in my local gas station. I could not order them from Amazon. I could not order them from anywhere. Today, I went and made friends with the store manager. “I have a project I need help with,” I told him. Now he has ordered me two boxes. One of the caramel filled and one of the solid chocolate. I also purchased the full box they had there and a stack of the caramel filled they had left. Now I just have to smuggle it all into Iceland. I am thinking of making cute labels to put on them for fanfest. My creativity and amusement are quite high at the moment. All told I should have around 60 bars to hand out unless I suddenly find the mother lode. Some sugar from Sugar type of thing. Just thinking of over wrappings . . .
You're Canadian? Holy! I would not have guessed. When I saw the photo of those bars, I said to myself "I've seen those up at the local Choices in New West." I did not know they were Canadian. I'm not much of a chocolate person. As I said on twitter, nope. One of the service stations down here has them. I convinced the manager to order me a box of each and they should be in on Sunday he says. That will give me just over 3 boxes so around 60 bars to pass out. Hopefully people want them and I don't have to drag them back home or stash them around CCPs office. Duty free limit for gifts to Iceland is 10.000 ISK. I just checked a converter and I should be right under the limit. :) RMT FTW!! I'll take one of the chocolate ones! Hope to see you there!